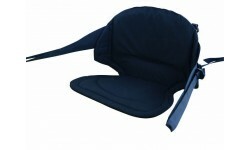 A comfortable backrest with padded seat, also features a small pocket on back of backrest. 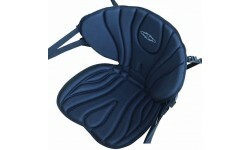 Best suited to FeelFree Kayaks but does fit some other sit-on-tops. Made up of a padded canvas material black in colour. The Deluxe Backrest provides increased comfort in the form of a higher finished back support & padded seat which also lifts the paddler out of any pool of water that might form in the seating area. Fits most sit on tops. 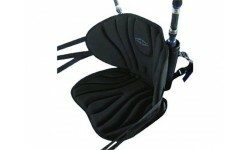 Offers all the comfort and adjustment of the FF Deluxe Backrest, with the addition of two rod holders. Ideal for trolling. Great way to convert your kayak into a fishing kayak without drilling. Nothing compares to the comfort that the Feel Free KingFisher seat. 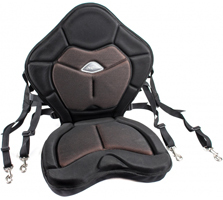 Its lumbar cushion gives the extra support in the lower back area while an internal skeleton retains shape and comfort for hour after hour with no adjustment.